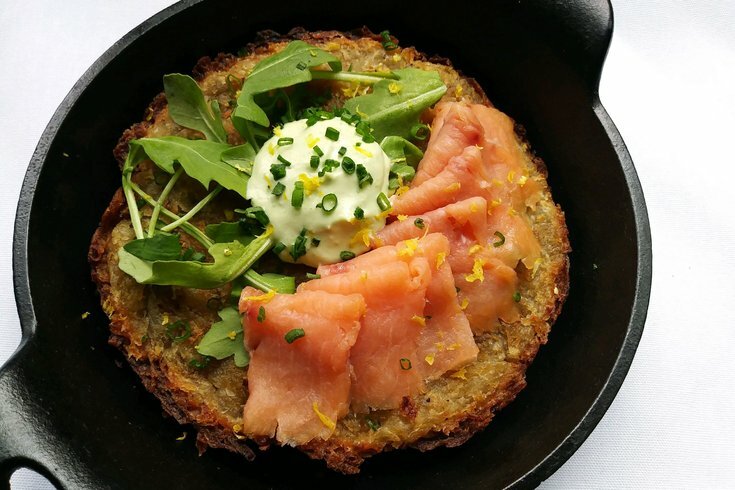 The Potato Rosti Skillet at Jet Wine Bar. For those who lack the time or the funds to travel the world in search of good food and wine, the folks at Jet Wine Bar have already done the work for you. Starting Thursday, Dec. 21, the South Street bar and restaurant will launch a monthly “Layover” series, highlighting wines and cuisine from different regions for food and drink pairings. Keeping in line with the holiday season, Thursday’s inaugural theme locale is the French Alps in what Jet is calling the “Apres-Ski” pop-up. Featured Italian and Swiss wines will be discounted at $9 a pop, and there will be three food specials in line with the theme. If you’re a grilled cheese fan, you will enjoy what sounds like one of the most extravagant cheese sandwiches ever: Taleggio served with bacon, spicy dijon, and apples on brioche for $10. You also can try the creamy polenta with Italian sausage ($12), or the potato rosti skillet ($11) served with crispy potato cake and smoked salmon. If you can’t make it to the first “Layover” pop-up, expect to see Tuscany- and Madrid-themed specials (aka, pasta and tapas!) in the coming months.